I found this on ebay and was wondering if it's any good. I did some google searching on the product name and it seemed to be an alright brand. I was wondering if anyone else has any real world information on it. Also (hypothetically) if I got it, what bits would be necessary to function as an e-file for gel nails? As for what drill bits for gel, well i can't help there, sorry, i dont do gel, only acrylic. I have the same Blueberry one that Lisa has, and use it with both gel and acrylic. The files that come with it work on both, but bought the gold medium K file from Georgy and use it for removing product and the others for shaping. I would agree it is a student e-file and at the moment it suits my purposes (and pocket). scorpion2 wrote: at the moment it suits my purposes (and pocket). $13 forthe file and $10 for postage!! Thanks... love eBay... Hubbie calls it "The Work of the Devil".... lol... Will definately be looking there when time comes to upgrade to an efile. Probably around the time someone runs a course I can get to. How have you found it to be vibration/handpiece heat etc? How does it go sitting on the desk or is it one you put in your apron pocket? is it noisy at all??? Vibration is very, very minimal, if it does get some slight vibration, it just needs a good cleen.. (dust at teh join, thats all) easily fixed! I have it sitting on the desk, it has a lightweight hand piece and is easy to use, no chuck needed which i like and it's digital so no speed guessing. Thanks for that mel, much appreciated. Lapistear wrote: I found this on ebay and was wondering if it's any good. I would probably recommend a diamond bit kit and some sanding bands. You don't really need carbide bits on gel (unless you do those super long stilettos... lol) because gel is quite easy to remove in comparison to liquid and powder enhancements. Usually diamond pieces are sufficient. Most of the machines mentioned have a very similar vibration. You want a high torque (280-350 gf.cm) machine which offers low vibration - you can barely feel it on. 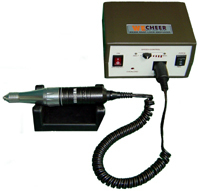 It cuts smiles lines and lifted areas quickly, easily and with no discomfort for the client. High vibration can make customers really uneasy and uncomfortable. I need something that i can use to file back length of acrylics, remove excess, buff with etc.. I ordered via my lecturer at my school. It's an Erica MT20, cost $600 which took me ages to save for and although I've only used it in a few classes so far, I find it's a dream to use and totally worth it. I'm now saving for a ventilation unit to go with it. One thing I cannot stand when walking past a nail shop is the overwhelming stench of fumes coming from them. Ugh!